Arsenal&apos;s XI from Carl Jenkinson&apos;s Premier League debut - where are they now? 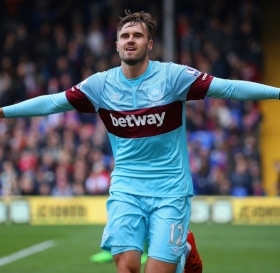 Leicester City tracking Carl Jenkinson? Leicester City are surprise candidates to sign Arsenal defender Carl Jenkinson this summer, as the right-back looks set to leave the Gunners in search of pastures new. According to reports, Jenkinson and Arsenal have yet to agree terms on a new contract with the player's contract set to expire on 1st July 2019. Fulham are surprise candidates to lure Arsenal defender Carl Jenkinson to Craven Cottage at the end of the current season. The Cottagers, who look likely to face relegation to the Championship, appear to be already planning their summer rebuilding programme ahead of dropping down a division. The father of Antonio Valencia has confirmed that Arsenal are among the clubs interested in signing the experienced defender when his contract with Manchester United expires in the summer. Arsenal legend Pires has advised the Gunners to consider a move for Crystal Palace defender Aaron Wan-Bissaka when the transfer window reopens in the summer. Carl Jenkinson offered Arsenal lifeline? Arsenal manager Unai Emery has reportedly decided to keep hold of right-back Carl Jenkinson for the campaign following the season-ending injury to Hector Bellerin. Arsenal manager Unai Emery has confirmed that Hector Bellerin has suffered a serious injury during the recent Premier League triumph over Chelsea. Arsenal have received a timely boost for the Cardiff City with midfielder Mesut Ozil said to have completely recovered from an illness which kept him out of the West Ham United game. Serie A newcomers Frosinone are reportedly on the cusp of landing the signature of Joel Campbell from Arsenal this month. Arsenal midfielder heading for Marseille move? French side Marseille are reportedly looking into a deal for Arsenal midfielder Mohamed Elneny before their transfer window closes this month. Arsenal goalkeeper David Ospina has supposedly turned down a move to Besiktas this summer after reaching a stumbling block in terms of the wages involved. Arsenal manager Unai Emery has ruled out the possibility of Danny Welbeck leaving the club after the English transfer window closed on Thursday. Arsenal are reportedly seeking to beat Manchester United in the race to sign Jerome Boateng from Bayern Munich this month. Arsenal forward on the cusp of summer exit? Arsenal winger Lucas Perez is reportedly heading for a summer exit with the Gunners said to have finalised a transfer package with Sporting Lisbon. Arsenal forward Lucas Perez is reportedly close to making the switch to Fiorentina before this month's transfer deadline. Arsenal manager Unai Emery has dropped five players from the Gunners' 25-man squad which has travelled to Singapore for the International Champions Cup. Unai Emery planning Arsenal player clear-out? Arsenal are planning to sell some of their players to make room for new ones, according to Goal. David Ospina and Carl Jenkinson are both likely to leave Arsenal next week, as newly appointed manager Unai Emery takes the opportunity to assess both players in pre-season training. Jenkinson looks set for a move to Leeds United whilst David Ospina will move to Turkey with Fenerbahce. Arsene Wenger is still confident that Arsenal have a strong enough squad to be in the title picture despite already losing two games.